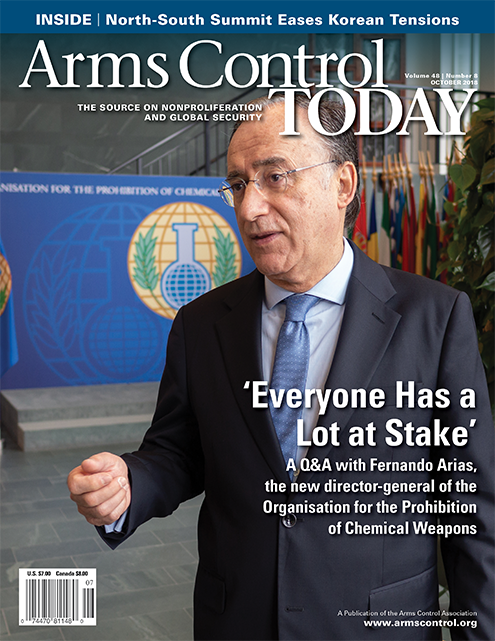 Fernando Arias, the new director-general of the Organisation for the Prohibition of Chemical Weapons, discusses the challenges to the international chemical weapons ban and how the OPCW is responding. Spanish diplomat Fernando Arias took office July 25 as the fourth director-general of the Organisation for the Prohibition of Chemical Weapons (OPCW), stepping into the leadership post at a time when the prohibition regime and international norms are being undermined by Syria’s open use of chemical weapons and by assassination plots using banned toxins blamed on Russia and North Korea. In response to questions last month from Arms Control Today’s Alicia Sanders-Zakre, Arias discussed the challenges facing the OPCW, the actions underway to document violators of the chemical weapons ban more fully, and the measures he is employing to improve the transparency and responsiveness of the 193-member-state organization that is the implementing body for the Chemical Weapons Convention (CWC). The war in Syria has put the issue of attribution in the spotlight, particularly in instances where member-state Russia, Syria’s ally, has used its UN Security Council veto to thwart investigations. The independent OPCW-UN Joint Investigative Mechanism (JIM) has determined that chemical weapons were used by Syria and the Islamic State group. With new authority granted by CWC member-states, Arias said he is putting in place arrangements for the purpose of identifying entities responsible for chemical weapons use. A special office for attribution will consist of a head of investigations and a few investigators and analysts who will be supported by existing Technical Secretariat expertise and structures. “Those responsible [for chemical weapons attacks] should now have nowhere to hide and should be held accountable by the international community for breaking the global norm against chemical weapons,” Arias said. Arias is a career diplomat who served as Spain’s UN ambassador from 2012 to 2013. Before becoming director-general, he served as Spain’s ambassador to the Netherlands and permanent representative to the OPCW from 2014 to 2018. Congratulations on your election. What is your top goal as director-general? I am committed to working with our member-states to protect, defend, and uphold the CWC. This means implementing the mandate given to the organization by the convention, as well as the decisions adopted by the executive council and the plenary body, the Conference of the States-Parties. I will also respect and develop the important work undertaken by my predecessors and their teams. The OPCW is charged with verifiably eliminating chemical weapons, preventing their re-emergence, and promoting chemistry for economic and technological development. I am especially interested in shaping a balanced organization that ensures a stringent verification regime and offers cooperation and assistance in the very wide field of peaceful uses of chemistry, while addressing the growing threat of re-emergence of chemical weapons use. Our organization has a track record of measurable results, and we will build on it. For instance, more than 96 percent of declared stockpiles have been eliminated. But there is ongoing work to verify the destruction of old chemical weapons that are a legacy of World War I and World War II and abandoned chemical weapons in China. Moving forward, we will have to evolve to meet the increasing needs of our member-states and the expectations of the international community. Doing so means good management of the organization and introducing the reforms necessary for keeping the OPCW fit for purpose and ready to face any new challenges. What are currently the greatest threats to the CWC regime? The main threat to the convention is the re-emergence of chemical weapons, which is no longer theoretical but rather a tragic reality. Despite the global ban, we have witnessed their ongoing use. What worries me is the proven willingness of governments, terrorists, and criminals to use chemicals as weapons indiscriminately. Chemical weapons belong in a history book, not on the front page of newspapers. The OPCW has almost fulfilled its foundational goal, the destruction of the world’s declared chemical weapons stockpiles. As mentioned, more than 96 percent of these stockpiles have been destroyed under the OPCW’s watchful eye. Although the remaining work is on track for completion by 2023, four more countries [Egypt, Israel (a signatory), North Korea, and South Sudan] need to join the convention before the world can have confidence that all chemical weapons stockpiles have been accounted for. As the world’s chemical weapons watchdog, our mission to verifiably destroy declared stockpiles has a conceivable end point. But our mission to prevent the re-emergence of chemical weapons requires constant vigilance in perpetuity. As we move into the postdestruction phase, our mission will be far from complete. In fact, it will only grow in significance and complexity. Destroying chemical weapons is a relatively straightforward exercise; preventing their re-emergence is much more complex. Science and technology are constantly evolving, introducing new potential for misuse. The OPCW’s experience and expertise makes it the undisputed global authority on chemical weapons. In response to an evolving security landscape, OPCW member-states and the Technical Secretariat have become increasingly agile and resilient as we respond to threats. Even so, we must continually adapt and grow to contribute to global security. This is especially crucial in an era of increasing competition for resources. Securing the resources the OPCW needs to uphold the global ban on chemical weapons requires the continued engagement of our member-states. Are you concerned about the erosion of the norm against chemical weapons use due to repeated chemical attacks by Syria, a CWC state-party? If so, how will you address this problem? Of course, I am concerned about any erosion of the norm. Any use of chemical weapons anywhere, by anyone, and for any reason is unacceptable. Chemical weapons use in Syria has been confirmed by both the OPCW’s Fact-Finding Mission and the JIM. These findings and recommendations represent an opportunity to uphold the prohibition against chemical weapons and to ensure accountability for those who violate it. This prohibition is unequivocal. All are bound to never, under any circumstances, develop, produce, stockpile, transfer, or use chemical weapons. Since April 2014, the OPCW has been investigating allegations of the use of toxic chemicals as weapons in Syria. Our technical teams of impartial, experienced, and expert chemists and inspectors seek to establish the facts. The facts confirm the use of chemical weapons, including sarin, chlorine, and sulfur mustard. The OPCW is making use of all of the legal tools at its disposal to clarify and resolve the remaining gaps, inconsistencies, and discrepancies with the Syrian declaration [of its stockpiles]. This will continue to take an investment of time and effort, and we are working with the Syrian authorities to ensure the convention’s rules are implemented. The nations that have committed themselves to the convention also have to take steps to protect the global prohibition enshrined within it. What challenges remain for completing the destruction of all declared chemical weapons? Verifiably destroying most of the world’s declared chemical weapons stockpiles has been an unparalleled achievement of the CWC. This treaty has so far proven to be the most successful at eliminating an entire category of weapons of mass destruction. However, the convention has yet to achieve universal membership. Until we reach it, we cannot know with confidence what other stockpiles of weapons may exist. I encourage the four remaining countries to join with the rest of the world and take up the responsibilities of the convention. The United States, which has the last remaining declared chemical weapons stockpile, is scheduled to complete its destruction by 2023. How will the OPCW’s role change once all declared chemical weapons stockpiles have been destroyed? The OPCW has always had a multifaceted mission. When people think of the OPCW, destruction of chemical weapons most likely comes to mind. This is true, but it is not our sole mission. We also aim to prevent the re-emergence of chemical weapons by working with governments, industry, and other international organizations. We have been working with our member-states to provide assistance and protection against chemical threats. In parallel, we strive to foster international cooperation to strengthen implementation of the convention and to promote the peaceful uses of chemistry. When all declared stockpiles have been verifiably eliminated, the OPCW will still be actively pursuing these goals. The organization needs to retain the knowledge, expertise, and equipment to support any future destruction activities. This may come about with the OPCW gaining new members. The same goes with addressing the threat of chemical weapons use. We need to maintain and broaden the expertise we have gained across the years if we want to be successful in fulfilling this mission. Eliminating chemical weapons in a way that is safe and secure and protects the environment, as mandated by the convention, is very expensive and very complex. Even once all declared stockpiles are destroyed, concerns will remain about the management and trade of chemicals. As long as there are those with malicious intent, the OPCW will continue its work with national authorities and the United Nations and other international organizations to reduce the risk of the diversion of chemicals in the fight against the harmful misuse of chemicals by anyone, anywhere, and under any circumstances. Will you increase transparency and civil society engagement, as the past two directors-general have done? Of course. Civil society has been a champion of the convention from even before its inception. The community of researchers, scientists, and nongovernmental organizations is essential for raising awareness of chemical weapons issues and keeping us all accountable. Over the last few years, there has been an emphasis on the role of education and outreach. I want to see this continue. The next generation of chemistry practitioners and decision-makers will play a critical role in ensuring that the global ban on chemical weapons remains strong. I will continue to encourage civil society to engage with the OPCW and its member-states. Since the last review conference, in 2013, we are projected to more than double civil society participation for this upcoming review conference, in November. As our organization focuses more and more on preventing the re-emergence of chemical weapons, we understand that achieving that goal will require the engagement of a much broader cross-section of society than before. Transparency is important for organizations to thrive. For instance, one step I have already taken is to ensure senior leadership positions are recruited through a more open and transparent process. For the first time, recently we have publicly advertised director-level vacancies in an effort to find the best and brightest for these critical roles. As the organization faces new challenges, we need strong leadership and a good, independent, and professional team. Another key to improved transparency is access to information. The OPCW has a new website that communicates with authority and trust while making information easy to find and use. This is part of an effort, initiated by my predecessor, to make the OPCW more engaging and accountable. This new website is a core part of our effort to use digital platforms such as social media to reach people all over the world. Before leaving office, your predecessor, Ahmet Üzümcü, called the OPCW’s former lack of attribution power a “major gap.” What should be the role of the OPCW in assigning blame for chemical weapons attacks? The international community has long placed its trust in the OPCW to rid the world of chemical weapons. Determining that a chemical weapon has been used is an essential step, but it is not enough. As of this past June and through the decision adopted by the Conference of States-Parties, the OPCW has been tasked with the mission to identify the perpetrators. So far, we have been detectives who could only say if a crime has happened; now we can identify who did it. But it is up to a court or others to determine the consequences. Attribution is not accountability. Those responsible should now have nowhere to hide and should be held accountable by the international community for breaking the global norm against chemical weapons. Achieving justice involves a wider range of international institutions and mechanisms, but the OPCW will do its part in the process. Attribution will be our contribution. How will you advance the recent decision in late June to give the OPCW the mandate to assign blame for chemical weapons attacks in Syria? To clarify, the decision adopted by the Conference of States-Parties addresses the threat of chemical weapons use. It is not only about Syria. Instead, the decision lays out several avenues for OPCW action to address the use of chemical weapons. For instance, the OPCW has been tasked for the first time to investigate uses of chemical weapons for the purposes of attribution. We will take on this task in instances where the Fact-Finding Mission has determined chemical weapons were used or likely used in Syria. We would also do this if a member-state investigating possible chemical weapons use on its territory asks us for assistance. The OPCW will help with efforts to pursue justice by preserving and providing information to relevant UN investigatory entities. We have been asked to further assist our member-states in preventing chemical terrorism while helping them develop protection against a potential attack. Finally, per the request of the Conference of States-Parties, we will propose measures to strengthen the verification regime. I am confident that all of these measures, once identified and implemented, will help to make our world a safer place. I have set up a task force that has been working swiftly and intensively to implement the decision. The task force has consulted with relevant international organizations and structures that deal with attribution issues. The Technical Secretariat currently has the capability to support this new mission, but we need additional and complementary expertise and skills in investigations, forensics, and related analysis. The task force has assessed the human, financial, and technological resources and organizational structures needed. Taking on this new mission successfully requires adequate resourcing. I have faith that our member-states will grant the OPCW the means it needs to fulfill the mission they have given us. In terms of chemical weapons use in Syria, we are creating a new office responsible for attribution that will report directly to me. This special office for attribution will consist of a head of investigations and a few investigators and analysts who will be supported by existing Technical Secretariat expertise and structures. As attribution can serve to deter the use of chemical weapons, this is one way that we are implementing our mandate to prevent the re-emergence of chemical weapons. We need to take an integrated approach to this issue, using our current skills and recruiting new staff and resources to meet demands for specific skill sets. The OPCW’s findings must hold up to technical and legal scrutiny. The design and implementation of the decision must be beyond reproach to ensure that those who are identified as responsible for the use of chemical weapons are ultimately held accountable, not by the OPCW but by the appropriate authorities. What should states-parties do at the Fourth CWC Review Conference in November to strengthen the treaty? The conference is a crucial yet narrow window of opportunity for our member- states to set the OPCW’s strategy and priorities for the next five years. Its outcomes may have a lasting impact on the tone and structure of the organization as we further transition into the postdestruction era. The increasing focus on preventing the re-emergence of chemical weapons and confronting the threat of chemical weapons use will mean changes for what we do and how we do it. Accordingly, the conference must consider how to match sustainable resources to the responsibilities and composition of the OPCW. The time allocated for the review conference is short, but the stakes for the organization are high. Member-states have gathered to deliberate on the future priorities of the OPCW and the work of the conference. These deliberations are the foundations for what I hope will be a forward-looking and constructive outcome document. For more than 20 years, these governments have invested in a global effort to verifiably eliminate declared stockpiles of chemical weapons, while preventing the re-emergence of such weapons and simultaneously promoting the peaceful uses of chemistry. In the face of today’s threats, everyone has a lot at stake to make sure the regime underpinned by the CWC continues to function and adapt as needed. Banishing the scourge of chemical weapons depends on those who have built the international system to make full use of it. The senseless loss of life is a reminder that the protection promised by the convention is only as strong as those willing to uphold it. The treaty prohibits the development, production, manufacture, acquisition, possession, stockpiling, transfer, stationing, installation and threat of use of nuclear weapons. Why Japan needs a different plan to attain its stated goal of reducing its plutonium stockpile. Facing U.S. diplomatic pressure and the expiration of the initial 30-year term of the 1988 U.S.-Japanese nuclear agreement, the Japan Atomic Energy Commission (JAEC) in late July revealed a plan ostensibly intended to reduce Japan’s massive 47-metric-ton stockpile of unirradiated plutonium by boosting the use of mixed-oxide (MOX) fuel in the country’s nuclear power reactors. This plan unfortunately would make the problem worse. It also contradicts the findings of a just-published study that the Nuclear Proliferation Prevention Project researched for a year, examining the seven countries, including Japan, that have commercially used or produced MOX fuel for thermal nuclear power plants.1 The research found that five of these countries already have decided to phase out MOX fuel, which is a blend of plutonium with uranium, due to concerns about economics, security, and public acceptance. The JAEC has correctly identified the problem but not the solution. The surplus 47 metric tons of plutonium is sufficient to make more than 5,000 nuclear weapons. Japan is now the only country without such weapons that reprocesses its spent nuclear fuel, creating still more plutonium. Japan even plans to start commercial operation in 2021 of a domestic reprocessing plant that would produce up to an additional eight metric tons of plutonium annually. The Japanese government was wise to declare a policy to reduce its plutonium stockpile. Yet, the JAEC strategy to do so by increasing the use of MOX fuel in the country’s nuclear power reactors is wrong for at least four reasons: it is impossible to do in the near term, counter-productive, not the quickest way to reduce the stockpile, and unsuitable for most of Japan’s domestic plutonium. Before discussing the flaws of the JAEC plan and offering an alternative, it is important to understand the roots of the current situation. Japan’s massive plutonium stockpile is the result of five decades of technological and policy failure. In 1966, Japan started producing nuclear energy commercially and, at its peak, the country had nearly 60 traditional light-water reactors (LWRs), using non-weapons-usable uranium fuel to supply the country with 34 percent of its energy.3 Regrettably, based on ill-founded fears of global uranium shortages, Japan also followed the trend of the 1960s by planning to construct and operate fast-neutron breeder reactors (FBRs), aiming to increase the energy value of uranium by converting more of it to plutonium for use as reactor fuel. Japan did not come anywhere close to meeting its intended 1997 start date for deployment of MOX fuel in LWRs. Indeed, it missed by more than a decade. The multiple reasons for that delay help illustrate the foolhardiness of the JAEC’s new plan to expand MOX fuel use. In October 1999, the Japanese utilities were on the verge of loading MOX fuel into the Fukushima Daiichi-3 and Takahama-4 reactors,17 but reports emerged that BNFL had falsified quality-control data of the MOX fuel for the KEPCO reactors. Takahama-4 was intended to be the first reactor to use MOX fuel after receiving its eight assemblies in October 1999. Two months prior, BNFL discovered and then disclosed that its employees had falsified data for other MOX fuel still in the UK but intended for the sister reactor, Takahama-3. This raised concerns that the data for the Takahama-4 fuel, just arriving in Japan, also had been falsified. Apparently trying to hinder such external oversight, BNFL did not release computer files but only paper books of data on the pellet size. Undeterred, the two NGOs copied and distributed the paper data sets for local citizens to assist in reviewing and then produced an analysis showing that BNFL had falsified the quality control, which UK regulatory authorities confirmed in November 1999.20 It turned out that BNFL employees had not manually measured the size of pellets, as required, but simply copied and pasted the measurements from earlier batches. Despite this vote, the mayor of Kariwa was on the verge of approving MOX fuel use in 2002, but it was revealed that TEPCO had concealed its periodic inspections data. In September 2002, the prefecture formally withdrew its approval for MOX fuel use. As of July 2018, the fresh MOX fuel assemblies still had not been inserted into the reactor, 17 years after they were delivered.26 This poses a security risk because the unirradiated MOX fuel contains over 200 kilograms of plutonium, sufficient for at least 20 nuclear weapons. Renewed Japanese support for MOX fuel emerged in 2007, when three Japanese utilities signed contracts with AREVA, which started producing the fuel to be delivered between 2007 and 2020.27 Six Japanese utilities eventually signed MOX fuel contracts between 2006 and 2010 (table 2). Although 401 assemblies were contracted to be fabricated by AREVA, only 133 had been received by Japanese utilities as of 2018. Japan’s pilot-scale reprocessing plant is being decommissioned, but the Japanese government still anticipates the start of commercial operations at the Rokkasho reprocessing plant in 2021, producing up to an additional eight metric tons of plutonium annually.31 This plan continues on apparent autopilot despite Japan having terminated the FBR program, which was the original rationale for reprocessing, and the country currently operating only a fraction of its LWRs in the wake of the Fukushima disaster. The consequence of reprocessing spent fuel for four decades, while failing repeatedly to implement large-scale use of MOX fuel, is that Japan has accumulated more than 47 metric tons of unirradiated plutonium. That is more plutonium than in the nuclear weapons programs of the UK, France, China, Israel, India, Pakistan, and North Korea—combined. On July 31, 2018, the JAEC issued its revised guidelines titled “Basic Principles on Japan’s Utilization of Plutonium.”34 This document initially declares, promisingly, that “Japan will reduce the size of its plutonium stockpile,” but the strategy is actually based on boosting plutonium commerce by “promoting collaboration and cooperation among the operators” of Japan’s nuclear power plants to increase their use of MOX fuel. Further revealing the intention to expand the plutonium economy, the JAEC reports that “Japan Nuclear Fuel Limited (JNFL) plans to complete the construction of the Rokkasho Reprocessing Plant and the MOX Fuel Fabrication Plant in the first half” of fiscal years 2021 and 2022, respectively. This policy, ostensibly intended to reduce Japan’s plutonium stockpile by increasing domestic use of MOX fuel, has four major problems. First, Japan cannot quickly accelerate use of MOX fuel because it lacks the reactors to do so. Only nine Japanese reactors are licensed to use MOX fuel. Of those, two (Onagawa-3 and Kashiwazaki Kariwa-3) have not applied to restart in the wake of the 2011 earthquake-driven Fukushima disaster. The potential restart of two others (Tomari-3 and Shimane-2) is hindered by related earthquake concerns. In Shizuoka, the governor and mayors oppose the restart of another reactor (Hamaoka-4). Operation of a sixth reactor (Ikata-3) was suspended in December 2017 by court injunction. That leaves only three reactors that currently can operate with MOX fuel: Takahama-3 and -4 and Genkai-3. Together they annually can irradiate only 1.5 metric tons of plutonium, or barely 3 percent of Japan’s stockpile, a rate much too slow to address international concerns. Second, even if Japan could increase the use of MOX fuel by licensing other reactors to use it, that would be counterproductive. Increased domestic use of MOX fuel would spur calls from Japan’s nuclear industry to finalize the domestic reprocessing plant and finish construction of the adjoining MOX fuel fabrication facility, which is only 12 percent complete because work was suspended after the Fukushima accident. The JAEC plan says the MOX fuel industry should “minimize the feedstock” of plutonium, but Japanese officials insist they will need a five-year working stock, which is potentially up to 40 metric tons of plutonium, in light of the new reprocessing plant’s capacity of eight metric tons annually. This obviously would not solve the plutonium-stockpile problem but rather perpetuate and magnify it in Japan. For perspective, the working stock of France’s MOX fuel industry is 35 metric tons of plutonium, but Japanese officials say that Japan’s more diverse reactors would require a greater variety of MOX fuel and thus extra working stock. Third, there are quicker and safer ways for Japan to reduce its plutonium stockpile. About 21 (soon to be 22) metric tons of Japan’s plutonium, nearly half the stockpile, is in the UK, which has offered to take ownership for the right price. Other countries already have accepted this UK offer, including Germany, the Netherlands, Spain, and Sweden.35 Japan should do likewise, quickly paying the UK to take title to all of its plutonium there, which overnight would cut Japan’s stockpile by 45 percent, much faster than the 3 percent annual reduction through MOX fuel use. Japanese utilities also could save money by doing so because they would avoid the expense of storing the plutonium in the UK and eventually fabricating it into MOX fuel, which costs nine times more than LEU fuel.36 Japan’s government could even subsidize the title transfer by using its reprocessing fund, which holds payments by utilities to manage nuclear waste. Fourth, most of Japan’s 10 metric tons of domestic unirradiated plutonium cannot currently be used in its reactors. More than six metric tons are in the form of separated plutonium, which Japan has no commercial facility to fabricate into MOX fuel. Another nearly two metric tons was fully or partially fabricated into a different type of fuel for the now-terminated FBRs, which cannot be inserted into LWRs. That means only 1.7 metric tons of the unirradiated plutonium in Japan, contained in imported MOX fuel, is readily usable in reactors, and some of it only if more reactors are restarted. For the other eight metric tons held domestically, Japan could develop technology to dispose of it as waste in coordination with the United States, which last May announced its own plan to dispose of 34 metric tons of weapons plutonium as waste. To the JAEC’s credit, its plan calls for examining the “disposal of plutonium that is associated with research and development purposes.” Tokyo and Washington already have a mechanism for such technical cooperation, known as the U.S.-Japan Plutonium Management Experts Group, which should be revitalized to expedite such disposal. Japan needs a different plan than boosting use of MOX fuel to attain its stated national goal of reducing its plutonium stockpile. To start, Japan should pay the UK to take ownership of the 22 metric tons there. Next, Tokyo should work with Washington on technology to quickly dispose as waste the eight metric tons of plutonium in Japan that cannot readily be used as fuel. That leaves about 15.5 metric tons of plutonium in France and two metric tons in Japan, a more manageable quantity that could be dealt with relatively quickly as a combination of waste and MOX fuel. Assuming Japan does not secretly wish to preserve a nuclear weapons option, this proposed road map could reduce its plutonium stockpile rapidly. If Japan instead expands use of MOX fuel as the JAEC recommends, thereby increasing its domestic stockpile of plutonium, neighboring countries will question Japan’s intentions and respond accordingly. That could ignite a latent or, even worse, actual nuclear arms race in East Asia. The Japanese government should think twice to make sure that its energy policy does not undermine its security policy. 1. Nuclear Proliferation Prevention Project, “Plutonium for Energy?” n.d., http://sites.utexas.edu/prp-mox-2018/. 3. Japan Atomic Energy Commission (JAEC), “Plutonium Utilization in Japan,” October 2017, p. 1, http://www.aec.go.jp/jicst/NC/iinkai/teirei/siryo2017/siryo38/siryo3-1.pdf; Susan E. Pickett, “Japan’s Nuclear Energy Policy: From Firm Commitment to Difficult Dilemma Addressing Growing Stocks of Plutonium, Program Delays, Domestic Opposition, and International Pressure,” Energy Policy, Vol. 30, No. 15 (December 2002): 1337–1355. 4. Pickett, “Japan’s Nuclear Energy Policy,” p. 1341. 5. International Panel on Fissile Materials (IPFM), “Plutonium Separation in Nuclear Power Programs: Status, Problems, and Prospects of Civilian Reprocessing Around the World,” July 2015, p. 62, http://fissilematerials.org/library/rr14.pdf. 6. “Opposition to Dangerous MOX Fuel,” Nuke Info Tokyo, No. 127 (November/December 2008), pp. 1-2, http://www.cnic.jp/english/newsletter/pdffiles/nit127.pdf. 7. “Japanese Government Says Monju Will Be Scrapped,” World Nuclear News, December 22, 2016, http://www.world-nuclear-news.org/NP-Japanese-government-says-Monju-will-be-scrapped-2212164.html. 8. Kenichiro Kaneda, “Plutonium Utilization Experience in Japan,” in Mixed Oxide Fuel (MOX) Exploitation and Destruction in Power Reactors, ed. E.R. Merz et al. (Dordrecht: Springer, 1995), p. 163. 9. JAEC, “Plutonium Utilization in Japan,” p. 3. 10. Milton Hoenig, “Production and Planned Use of Plutonium in Japan’s Nuclear Power Reactors During 30-Year Base Period of the Proposed U.S.-Japan Agreement” (statement before the U.S. House of Representatives Committee on Foreign Affairs hearing on the United States-Japan Nuclear Cooperation Agreement, March 2, 1988). 11. “Opposition to Dangerous MOX Fuel.” In 2005 the deadline for expanding mixed-oxide (MOX) fuel to this many reactors was pushed back five years to 2015. 12. Jinzaburo Takagi et al., “Comprehensive Social Impact Assessment of MOX Use in Light Water Reactors,” Citizens’ Nuclear Information Center (CNIC), November 1997, p. 252, http://www.cnic.jp/english/publications/pdffiles/ima_fin_e.pdf. 13. Mayumi Negishi, “High Waves Hamper MOX Fuel Delivery,” Japan Times, September 22, 1999; IPFM, “Mixed Oxide (MOX) Fuel Imports/Use/Storage in Japan,” April 2015, http://fissilematerials.org/blog/MOXtransportSummary10June2014.pdf. 16. Cumbrians Opposed to a Radioactive Environment, “MOX Transport,” n.d., http://corecumbria.co.uk/mox-transport/ (accessed September 18, 2018). 17. Edwin S. Lyman, “The Impact of the Use of Mixed-Oxide Fuel on the Potential for Severe Nuclear Plant Accidents in Japan,” Nuclear Control Institute, October 1999, http://www.nci.org/j/japanmox.htm. 18. “The MOX Fuel Conundrum,” Japan Times, July 26, 2013. 19. Aileen Mioko Smith, interview with with Hina Acharya, Kyoto, Japan, January 6, 2018. 21. “BNFL Execs Bid to Drum Up Trust and New Deals,” Japan Times, September 20, 2000. 22. “Another MOX Scandal?” Nuclear Monitor, No. 542 (January 2001), https://www.wiseinternational.org/nuclear-monitor/542/another-mox-scandal. 23. “Tepco Not to Be Punished in Reactor Crack Scandal,” Japan Times, September 15, 2001. 24. CNIC, “Japanese Nuclear Power Companies’ Pluthermal Plans,” March 2007, http://www.cnic.jp/english/topics/cycle/MOX/pluthermplans.html. 25. David Cyranoski, “Referendum Stalls Japanese Nuclear Power Strategy,” Nature, No. 411 (June 14, 2001), p. 729; “Niigata Village Says No to MOX Fuel Use at Nuke Plant,” Japan Times, May 28, 2001. “刈羽村住民投票でプルサーマル反対が多数,” May 28, 2001, http://www.kisnet.or.jp/nippo/nippo-2001-05-28-1.html. 26. “MOX Fuel Unloaded in Niigata; Security Tight as British Ship Docks at Tepco Nuclear Plant,” Kyodo, March 25, 2001. 27. Areva, “Reference Document 2006,” April 27, 2007, http://www.sa.areva.com/mediatheque/liblocal/docs/groupe/Document-reference/2006/pdf-doc-ref-06-va.pdf. 28. Japanese Office of Atomic Energy Policy, “The Status Report of Plutonium Management in Japan - 2017,” July 31, 2018, http://www.aec.go.jp/jicst/NC/about/kettei/180731_e.pdf. 29. This excludes the small amount of plutonium in experimental MOX-fuel assemblies inserted in two reactors in the 1980s. 30. “Compliance with New Nuclear Power Plant Regulatory Standards,” Kakujoho, http://kakujoho.net/npt/aec_pu2.html#moxstts; Masafumi Takubo, email to author, July 3, 2018. See Japan Nuclear Safety Institute, Licensing Status for the Japanese Nuclear Facilities,” August 10, 2018, http://www.genanshin.jp/english/facility/map/. 31. “Decommissioning Plan for Tokai Approved,” World Nuclear News, June 13, 2018, http://www.world-nuclear-news.org/WR-Decommissioning-plan-for-Tokai-approved-1306184.html; Masafumi Takubo, “Closing Japan’s Monju Fast Breeder Reactor: The Possible Implications,” Bulletin of the Atomic Scientists, Vol. 73, No. 3 (May 2017): 183. 32. Gregory S. Jones, Reactor-Grade Plutonium and Nuclear Weapons: Exploding the Myths (Arlington, VA: Nonproliferation Policy Education Center, 2018). 33. Japanese Office of Atomic Energy Policy, “The Status Report of Plutonium Management in Japan - 2017.” Japan’s plutonium in the UK will rise by another 0.6 metric tons by 2019, after proper crediting of additional plutonium separated from Japanese spent fuel by reprocessing in the United Kingdom. 34. JAEC, “The Basic Principles on Japan’s Utilization of Plutonium,” July 31, 2018, http://www.aec.go.jp/jicst/NC/iinkai/teirei/3-3set.pdf. 35. UK Department of Energy and Climate Change (DECC), “Plutonium Deal Brings Security Benefits,” July 3, 2014, https://www.gov.uk/government/news/plutonium-deal-brings-security-benefits--2; DECC, “Statement by Michael Fallon: Management of Overseas Owned Plutonium in the UK,” April 23, 2013, https://www.gov.uk/government/speeches/management-of-overseas-owned-plutonium-in-the-uk; UK Department for Business, Energy and Industrial Strategy, “Management of Overseas Owned Plutonium in the UK,” HLWS425, January 19, 2017, https://www.parliament.uk/business/publications/written-questions-answers-statements/written-statement/Lords/2017-01-19/HLWS425/. 36. “MOX imports have cost at least ¥99.4 billion, much higher than uranium fuel,” Energy Monitor Worldwide, February 23, 2015. Alan J. Kuperman is an associate professor at the LBJ School of Public Affairs at the University of Texas at Austin, where he is coordinator of the Nuclear Proliferation Prevention Project (NPPP). Hina Acharya is a 2018 graduate of the school’s Master of Global Policy Studies program. This article draws on her chapter, “MOX in Japan: Ambitious Plans Derailed,” in the NPPP’s recent book Plutonium for Energy? Explaining the Global Decline of MOX. Research for this article was supported by a grant from the John D. and Catherine T. MacArthur Foundation. The terms and timing for denuclearization remain uncertain. Moon’s diplomacy puts additional pressure on North Korea and the United States to resolve their diplomatic impasse over the terms for Kim giving up his nuclear arsenal on a short timetable. At the same time, Moon’s active efforts to lower tensions and expand cooperation contrasts with U.S. President Donald Trump’s “maximum pressure” strategy, including sanctions intended to squeeze the Kim regime economically. To advance steps intended to remove “the danger of war” and move toward “a fundamental resolution” of hostile relations, the defense ministers of North and South Korea signed a document committing the two sides to a series of military confidence-building measures. Further high-level bilateral talks are planned, including a visit to Seoul by Kim this year for what would be the first visit to the South by a North Korean leader. The Kim-Moon meeting on Sept. 18–20, officially the third inter-Korean summit, follows the June summit between Trump and Kim in Singapore, at which U.S. Secretary of State Mike Pompeo said on Sept. 20 that Kim agreed to “rapid denuclearization” by 2021. The exact nature of that understanding has been unclear, and a follow-on visit to Pyongyang by Pompeo, planned for August, was abruptly canceled by Trump, who cited a lack of progress on denuclearization. Although the Pyongyang summit builds on the agreements and commitments made through the prior Moon-Kim summit held in Panmunjom in April, it is not yet clear whether the latest meeting will lead to tangible progress between the United States and North Korea on denuclearization and peace on the peninsula. Aside from an offer to allow “experts from relevant countries” to observe the dismantling of a missile testing facility at Dongchang-ri, North Korea did not commit to any new denuclearization steps. Before the Singapore summit, North Korea voluntarily announced a moratorium on nuclear and long-range ballistic missile tests and destroyed tunnels at a site used for nuclear testing. Since that summit, Pyongyang has begun dismantling facilities used for rocket and missile engine tests and launches at Dongchang-ri. In the Korean summit statement, Kim said North Korea is willing to take additional measures, such as the permanent dismantlement of the nuclear facilities at Yongbyon, “as the United States takes corresponding measures in accordance with the spirit” of the Kim-Trump statement in Singapore. That statement linked progress on denuclearization to further “efforts to build a lasting and stable peace regime,” and North Korea has since called on the United States to agree to a joint political declaration on the end of the Korean War. The verifiable decommissioning of Yongbyon, the site of North Korea’s main nuclear weapons material production complex, would be a major breakthrough. The facilities there, including a five-megawatt research reactor, a spent fuel reprocessing facility, and a uranium-enrichment facility, are still being used to produce bomb-grade nuclear material. North Korea is believed to operate at least one other uranium-enrichment facility. In postsummit remarks to the news media Sept. 20, Moon said that Kim “expressed his wish that he wanted to complete denuclearization quickly and focus on economic development.” Kim said he hoped that Pompeo would visit North Korea soon and that a second summit with Trump would take place in the near future to advance the denuclearization process, according to Moon. In his Sept. 20 remarks, Moon urged Trump to pursue a second summit with Kim, and he urged all parties to declare the end of the war as soon as possible. A peace treaty would be sealed, as well as normalization of North Korean-U.S. relations, after the North achieves “complete denuclearization,” he added. Trump, in a Sept. 20 tweet, called the results in Pyongyang “very exciting!” Pompeo issued a formal statement Sept. 21 praising the outcome and offering to resume the bilateral dialogue based on North Korean commitments. “This will mark the beginning of negotiations to transform U.S.-[North Korean] relations through the process of rapid denuclearization…to be completed by January 2021, as committed by Chairman Kim, and to construct a lasting and stable peace regime” on the Korean peninsula. Trump administration officials have not explained how they define “rapid denuclearization,” and it remains unclear whether such steps can be achieved in the next 27 months. It also does not appear that there is a common understanding between North Korea and the United States on what denuclearization would involve. With Pompeo now planning to travel to Pyongyang in October, Trump eased previous demands for "rapid" denuclearization, assuming North Korea doesn't resume nuclear and missile tests. Trump said he doesn't want to get into a "time game," and the United States will maintain sanctions. "If it takes two years, three years, or five months, it doesn’t matter," he said. Even as U.S. officials say they are open to further talks, the Trump administration is seeking to tighten implementation of international sanctions on North Korea. Pompeo chaired a foreign ministerial-level session of the UN Security Council on Sept. 27 focused on North Korea. A UN panel of experts monitoring sanctions compliance reported that there is ample evidence that North Korea is still managing to sell arms illicitly, secure prohibited fuel shipments, and engage in financial dealings to help sustain its economy. Will the Trump administration let the treaty expire? Several Republican senators are expressing support for extending the 2010 New Strategic Arms Reduction Treaty (New START) amid signals that the Trump administration may choose not to renew the pact. “We ought to be a little bit more pro-continuing the benefits the [New] START treaty gives us rather than getting the idea there might be some way we get out of it,” said Sen. Johnny Isakson (R-Ga.) Sept. 18 at a Senate Foreign Relations Committee hearing on U.S.-Russian arms control efforts. Russian President Vladimir Putin has repeatedly expressed interest in extending the treaty, which was ratified in 2011, although Russia has raised concerns about some of the procedures the United States has used to remove nuclear weapons launchers from accountability under the agreement. Since 2014, the United States has accused Russia of testing and deploying ground-launched cruise missiles in violation of the 1987 Intermediate-Range Nuclear Forces (INF) Treaty and is reviewing what the State Department calls defensive options in case Russia’s actions “result in the collapse of the treaty.” (See ACT, January/February 2018.) Moscow denies it is violating the agreement and instead has accused Washington of breaching the accord. Neither Thompson, nor David Trachtenberg, the deputy undersecretary of defense for policy, would provide their views on what the implications would be if New START were allowed to expire in 2021 with nothing to replace it. Trachtenberg testified alongside Thompson at the Sept. 18 hearing. The testimony from Thompson and Trachtenberg seemed to surprise and trouble some Republican committee members, particularly the question of linking continuation of New START to disputes involving other arms control treaties. Further, administration officials have had little to say publicly about the benefits of New START limitations to restrain the U.S. and Russian nuclear arsenals. First a no, then a yes on certifying a Russian aircraft as disputes hold up treaty flights. The Iran nuclear deal remains on life support, as U.S. President Donald Trump redoubles his efforts to kill an arrangement that is successfully restraining Iran’s nuclear program. Nearly five months after Trump unilaterally withdrew from the 2015 accord, Iran continues to comply with restrictions on its nuclear activities as the European Union, Germany, France, and the United Kingdom seek work-arounds to renewed U.S. sanctions on the Islamic republic. Iranian President Hassan Rouhani wrote in a Sept. 23 column in The Washington Post that he is allowing a “short grace period” to see what the other parties to the accord, including Russia and China, are able to do to offset Trump’s pressure tactics, notably U.S. efforts to prevent Iranian oil sales. U.S. officials are pressuring states that import Iranian oil to cut purchases or face severe sanctions that will enter back into effect Nov. 5. The other parties to the nuclear deal met at the United Nations on Sept. 24, the eve of Trump’s second General Assembly address, to assess what they called “practical proposals” to offset U.S. actions and to protect “legitimate business” dealings with Iran. Afterward, EU foreign policy chief Federica Mogherini, speaking alongside Iranian Foreign Minister Mohammad Javad Zarif, said the parties agreed to establish a “special purpose vehicle” to facilitate purchases of Iranian imports and exports, including oil. This puts the countries, including close U.S. allies, in direct defiance of Trump, who told the General Assembly on Sept. 25 that the United States will increase its “campaign of economic pressure” on Tehran. U.S. Secretary of State Mike Pompeo and John Bolton, Trump’s national security adviser, warned allies and others against trying to evade sanctions. Bolton characterized the European plan as just rhetoric and suggested any such action would have consequences. “We do not intend to have our sanctions evaded by Europe or by anyone else,” he said in a speech Sept. 25 detailing the administration’s redlines for Iranian leaders. Trump, at the UN, said the oil-related sanctions will be followed by other punitive measures to thwart what he characterized as a “corrupt dictatorship” that still harbors nuclear weapons ambitions and foments turmoil in the Middle East through its support of militant groups. But it is the United States that appears isolated. At a special UN Security Council session chaired by Trump Sept. 26, called to highlight nonproliferation priorities, top leaders one after the other directly criticized his decision to abandon the Iran deal and urged Tehran to continue to comply with the accord. The Trump administration, which denies an overt goal of regime change, has said it is seeking to force Iran to negotiate a more wide-ranging deal that includes restraints on its regional interference and ballistic missile program and tighter restrictions on nuclear activities. Iran has ruled out such talks, at least until the United States returns to the nuclear accord negotiated during the Obama administration. Trump’s offer of direct talks “is not honest or genuine” given his actions, Rouhani said in his column. Rouhani told the UN General Assembly on Sept. 25 that beginning a dialogue starts with ending threats and unjust sanctions. The Europeans have been particularly determined to try to preserve the 2015 pact because it has effectively halted Iran’s nuclear advances and reopened a lucrative market for European trade and because they are alarmed by a drift toward an imaginable U.S. war with Iran, encouraged by Saudi Arabia and Israel. It is unclear whether their new initiatives to shield companies from U.S. sanctions will have much effect, with major European companies already abandoning Iran. More important may be what actions Iran’s biggest oil purchasers, China and India, take in light of the U.S. sanctions. Both have substantially reduced oil purchases, although it is uncertain what Beijing may decide in light of growing trade disputes with the Trump administration. Iran agreed to the nuclear deal in return for the lifting of U.S., EU, and UN sanctions, hoping for a boost to the country’s struggling economy. In the face of rising tensions with the Trump administration and internal mismanagement of the economy, the value of the Iranian currency has plummeted by as much as 70 percent in the past year, fueling protests against Rouhani’s government. Iranian officials have said they could restart nuclear activities, such as enriching uranium at prohibited levels, within days if there is a decision to do so. An Iranian decision to exit the nuclear deal might play well for anti-U.S. sentiment, but would pose a different set of risks for the regime. Iran has continued to abide by the terms of the nuclear agreement, according to an International Atomic Energy Agency (IAEA) report on Aug. 20, the first since the United States began reimposing sanctions Aug. 7. The report also said Iran is abiding by the deal’s more intrusive IAEA monitoring and verification mechanisms, which provide inspector access “to all the sites and locations” necessary to visit. The IAEA reports do not contain any details on what sites the agency visits outside of Iran’s declared nuclear program, but there are some indications that inspections took place at two universities in Iran in July. According to several news outlets, protests broke out over the IAEA presence. The report does not mention a reported new advanced-centrifuge production facility. The official Iranian news agency IRNA on Sept. 9 quoted Ali Akbar Salehi, head of the Atomic Energy Organization of Iran, as saying that the facility is “fully complete and set up.” The construction of such a facility does not violate the deal, but it would be a violation if Tehran manufactured centrifuges outside of the narrow scope of production permitted by the accord. The impasse reflects the tensions over advancing technologies for systems capable of autonomously identifying and attacking targets. The latest effort toward imposing binding international restrictions on so-called killer robots was thwarted by the United States and Russia, pushing off the divisive issue to a November meeting of states-parties to the Convention on Certain Conventional Weapons (CCW). For five years, officials representing member-states of the CCW, a 1990 treaty that seeks to outlaw the use of especially injurious or pernicious weapons, have been investigating whether to adopt a ban on lethal autonomous weapons systems. In late August, a group of governmental experts established by the CCW met to assess the issue, but it failed to reach consensus at a Geneva meeting and called instead for further discussions. The impasse reflects the tensions over an advancing set of technologies, including artificial intelligence and robotics, that will make possible systems capable of identifying targets and attacking them without human intervention. Opponents insist that such weapons can never be made intelligent enough to comply with the laws of war and international humanitarian law. Advocates say autonomous weapons, as they develop, can play a useful role in warfare without violating those laws. Concern over the potential battlefield use of fully autonomous weapons systems has been growing rapidly in recent years as the pace of their development has accelerated and the legal and humanitarian consequences of using them in combat have become more apparent. Such systems typically combine advanced sensors and kill mechanisms with unmanned ships, planes, or ground vehicles. Theoretically, fully autonomous weapons of this sort can be programmed to search within a predesignated area for certain types of threats—tanks, radars, ships, aircraft, and individual combatants—and engage them with onboard guns, bombs, and missiles on their own if communications are lost with their human operators. This prospect has raised the question whether these weapons, if used in a fully autonomous manner, will be able to distinguish between legitimate targets, such as armed combatants, and noncombatant civilians trapped in the zone of battle. Likewise, will they be able to distinguish between enemy combatants still posing a threat and those no longer capable of fighting because of injury or illness? Humans possess the innate capacity to make such distinctions on a split-second basis, but many analysts doubt that machines can ever be programmed to make such fine distinctions and so should be banned from use. Under the terms of the CCW, the 120 signatory states, which include China, Russia, and the United States, can negotiate additional protocols prohibiting certain specific classes of weapons. So far, five such protocols have been signed, including measures banning landmines, incendiary weapons, and blinding lasers. Starting in 2014, some member states have sought to initiate negotiations leading to a similar protocol that would ban the development and use of fully autonomous lethal weapons. Others were resistant to moving directly toward negotiations, but agreed to a high-level investigation of the issue. For that purpose, CCW member states established the experts group, comprised largely of officials from those states, to assess the implications of fielding autonomous weapons and whether starting negotiations on a protocol was justified. In the discussions that followed, several distinctive positions emerged. About two dozen countries, including Argentina, Austria, Brazil, Chile, China, Egypt, and Mexico, advocated for a legally binding prohibition on use of such weapons. A number of civil society organizations, loosely allied through the Campaign to Stop Killer Robots, also urged such a measure. Another group of states led by France and Germany, while opposing a legally binding measure, support a political declaration stating the necessity of maintaining human control over the use of deadly force. Wherever they stand on the issue of a binding measure, nearly every country represented in the experts group at the August meeting expressed opposition to the deployment of fully autonomous weapons. Nevertheless, a small group of countries, including Israel, Russia, South Korea, and the United States, rejected a legal prohibition and a political declaration, saying more research and discussion is necessary. For the United States, the resistance to a declaration or binding measure on autonomous weapons can be read as instinctive hostility toward any international measure that might constrain U.S. freedom of maneuver, a stance visible in the Trump administration’s animosity towardother multilateral agreements, such as the Iran nuclear deal. Further, U.S. opposition stems from another impulse: many senior U.S. officials believe that leadership in advanced technology, especially artificial intelligence, cyberoperations, hypersonics, and robotics, is essential for ensuring U.S. success in a geopolitical contest with China and Russia. “Long-term strategic competition, not terrorism, is now the primary focus of U.S. national security,” Defense Secretary Jim Mattis told the Senate Armed Services Committee on April 26. U.S. policy requires that a human operator be “in the loop” when making decisions before a weapons system, such as a missile-carrying drone, fires at a target. Still, the determination to ensure U.S. dominance in artificial intelligence and robotics virtually guaranteed U.S. opposition to any outcome of the experts group that may hinder progress in developing military applications of machine autonomy. “We believe it is premature to enter into negotiations on a legally binding instrument, a political declaration, a code of conduct, or other similar instrument, and we cannot support a mandate to enter into such negotiations,” Joshua Dorosin, deputy legal adviser at the State Department, said at the experts group meeting Aug. 29. Because decisions of the group are made by consensus, U.S. opposition, mirrored by Russia and a few other countries, prevented it from reaching any conclusion at its meeting other than a recommendation to keep talking. Follow-up steps will be determined by CCW states-parties. They are due to meet in Geneva on Nov. 21–23, although it is unlikely they will reach consensus on anything beyond continuing discussions. Member organizations of the Campaign to Stop Killer Robots are lobbying participating delegations to act more vigorously and to consider a variety of other pathways to banning the development of fully autonomous weapons systems, perhaps outside the CCW framework. Four more countries complete elimination, as states-parties increase to 104. Delegates of states-parties to the Convention on Cluster Munitions, meeting Sept. 3–5 in Geneva, once again condemned any use of the weapons and celebrated successes in the decade since the treaty opened for signature. The annual meeting ended a half day early without controversy as states welcomed the March accession of Sri Lanka and Aug. 31 ratification by Namibia, which will become the 104th state-party when the treaty enters into force for it in February. Conference President Carlos Morales Dávila, Nicaragua’s deputy permanent representative to the UN and other international organizations in Geneva, also congratulated Croatia, Cuba, Slovenia, and Spain for reporting completion of the destruction of their cluster munition stockpiles. Research published by the Landmine and Cluster Munition Monitor program before the meeting found that 99 percent of stocks declared by states-parties had already been destroyed, a collective total of 1.4 million cluster munitions and more than 177 million submunitions. Under the treaty, states have eight years to destroy their cluster munitions. Thus far, no state has missed its deadline. The report also identified cluster munitions use in Yemen during the latter half of 2017 by the Saudi Arabia-led coalition fighting the Houthi, with such use beginning in 2015. None of the countries involved in the use of cluster munitions in that conflict are parties to the treaty. As in prior years, states-parties adopted a final report that “condemned any use by any actor” of cluster munitions. In a video message, Izumi Nakamitsu, UN high representative for disarmament affairs, called the convention an example of “disarmament that saves lives.” She said that the treaty has “had a concrete impact on the ground,” lauding stockpile destruction efforts and progress on clearance of contaminated land. According to the Landmine and Cluster Munition Monitor, at least 93 square kilometers of contaminated land were cleared in 2017 and at least 153,000 submunitions destroyed, an increase of 6 percent and 9 percent, respectively, from 2016. Next year’s meeting of states-parties is planned for Sept. 2–4 in Geneva, to be led by Aliyar Lebbe Abdul Azeez, Sri Lankan ambassador to the UN Office and other international organizations in Geneva. In 2020, Sabrina Dallafior Matter, the Swiss ambassador to the Conference on Disarmament, will preside over the treaty’s second review conference.